Registration opens here at 10:00 am on April 3 and costs £10. Red Bull has teamed up with Velosolutions to bring the competition to over 20 cities across the globe with riders battling it out in the hope of securing a place at the grand final. The championship continues to unite BMX and MTB riders with its new format which ensures that both bikes compete on a level playing field. Riders will battle it out in a timed pursuit competition in which competitors will ride head to head. North Lanarkshire will host the UK qualifier at the newly opened Wishawhill Wood Pump Track in Craigneuk. The track was built by North Lanarkshire Council and the work carried out by renowned international pump track specialists Velosolutions who transformed the area of wasteland into a world-class track with the support of the local community. It is supported by Socialtrack, Glencassels Community Development Project and Craignuek Community Council. The asphalt pump track is 260m in length and has a rather unique pinball triple berm section. Registration is open for the UK qualifier, it is accessible and open to anyone to compete for the World Championship title. Each qualifier will begin with timed runs from which the top 32 riders will advance to the knockout heats. Racing will take place as a head to head battle, which will be timed. The top 4 riders of each qualifier advance to the Red Bull Pump Track World Championship Final, with an all expenses paid trip. In 2018, Mark Ducat and Alyssa Podesta were crowned the UK winners, but it was David Graf and Christa von Niederhäusern, both from Switzerland, who were crowned as World Champions in the pouring rain at the Jones Center in Springdale, Arkansas, USA. Pump tracks are a worldwide success, combining rolling jumps with banked turns and they are accessible to all. Riders use the track features to gain momentum and attack the track as fast as possible. Claudio Caluori, CEO at Velosolutions said “The Red Bull Pump Track World Championship has advanced the sport of pump track racing to a whole new level. It was impressive to see how hard professionals and amateurs battled it out on Velosolutions Pump Tracks around the world”. Riders can train and prepare for the Red Bull Pump Track World Championship at local Velosolutions Pump Tracks, to find tracks head to: redbullpumptrackworldchampionship.com. 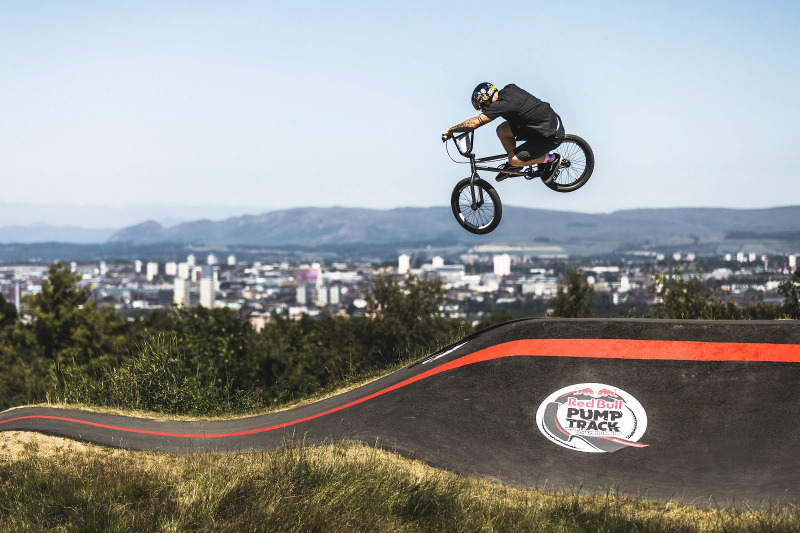 The Red Bull Pump Track World Championships will take place in the UK in North Lanarkshire on 17th August. Registration opens here at 10:00 am on April 3 and costs £10.